1888: 19 machinists meeting in locomotive pit at Atlanta, GA, vote to form a trade union. Machinists earn 20 to 25 cents an hour for 10-hour day. 1889: 34 locals represented at the first Machinists convention, held in Georgia State Senate Chamber, elect Tom Talbot as Grand Master Machinist. A monthly journal is started. 1890: First Canadian local chartered at Stratford, Ont. Union is named International Association of Machinists. Headquarters set up in Richmond, VA. Membership at 4,000. 1891: IAM Local 145 asks $3 for a 10-hour day. 1892: First railroad agreement signed with Atcheson, Topeka & Santa Fe. 1895: IAM joins American Federation of Labor (AFL), moves headquarters to Chicago. 1898: IAM Local 52, Pittsburgh, conducts first successful strike for 9-hour day. 1899: Time-and-a-half for overtime has become prevalent. Headquarters moved to Washington, D.C.
1903: Specialists admitted to membership. Drive begins for 8-hour day. 1905: Apprentices admitted to membership. There are 769 locals. Railroad machinists earn 36 to 43 cents an hour for 9-hour day. 1908: Metal Trades Department established within AFL with IAM President James O”Connell as president. 1911: Women admitted to membership with equal rights. 1912: Railway Employees Department established in AFL with Machinist A. O. Wharton as President. 1914: Congress passes Clayton Act limiting use of injunctions in labor disputes and making picketing legal. 1915: IAM wins 8-hour in many shops and factories. IAM affiliates with International Metalworkers Federation. 1916: Auto mechanics admitted to membership. 1918: IAM membership reaches 331,000. 1920: Headquarters moved to first Machinists Building, at 9th & Mt.Vernon Pl., N.W., Washington, D.C. British Amalgamated Engineering Union cedes its North American locals to IAM. 1920: Machinists earn 72 to 90 cents an hour for 44-hour week. 1922: 79,000 railroad machinists pin shopmen’s strike against second post-war wage cut. Membership declines to 148,000. 1924: IAM convention endorses Robert M. LaFollette, Sr., for President. 1926: Congress passes Railway Labor Act requiring carriers to bargain and forbidding discrimination against union members. 1927: IAM urges ratification of Child Labor Amendments to U.S. Constitution; 2,500,000 children under 16 are working at substandard wages. 1928: 250 delegates at 18th IAM convention urge 5-day week to alleviate unemployment. 1929: Depression layoffs cut IAM membership to 70,000. 1932: Congress passes Norris LaGuardia Act banning use of court injunctions in labor disputes.Wisconsin adopts first unemployment insurance act. Nearly 30% of union members are jobless. 1933: IAM backs National Recovery drive and 40-hour week. FOR picks IAM Vice President Robert Fechner to head new Civilian Conservative Corps. Membership sinks to 56,000. 1934: IAM establishes Research Department. 1935: Congress adopts National Labor Relations Act establishing right to organize and requiring employers to bargain in good faith. IAM opens drive to organize aircraft Industry. 1936: First industrial union agreement signed with Boeing, Seattle. IAM convention endorses FDR for President. Membership climbs to 130,000. 1937: Social Security and Railroad Retirement Acts now in operation. IAM negotiates paid vacations in 26% of its agreements. 1939: IAM signs first union agreement in air transport industry with Eastern. 1940: Machinists rates average 80 cents an hour. IAM pledges full support to National Defense program. IAM membership climbs to 188,000. 1941: IAM pledges hail support to win the war including no-strike pledge. 1944: 76,000 IAM members serve in armed forces. Total membership now 776,000. 1945: First agreement with Remington Rand. IAM convention votes to establish weekly newspaper, education department. Widespread layoffs follow end of World War II. 1946: 88% of IAM agreements now provide for paid vacations. 1947: Congress enacts anti-union Taft-Hartley Act. Machinists Non-Partisan Political League founded. IAM Legal Department established. Machinists average $1.56 an hour. 1948: IAM membership opened to all regardless of race or color.IAM convention endorses Harry Truman for President. 1949: Railroad machinists win 40 hour week. Membership down to 501,000. 1950: IAM joins International Transport Workers Federation. Machinists now average $1.82 an hour. 1951: IAM pledges full support of UN action in Korea. 1952: Employees on 85% of airlines now protected by IAM agreements. 92% of IAM contracts provide for paid holidays. 1953: IAM has contracts fixing wages and working conditions with 13,500 employers. IAM Atomic Energy Conference organized. 1955: AFL and Congress of Industrial Organizations (CIO) merge, Machinist Al Hayes elected Vice President and chairman of Ethical Practices Committee. 70% of IAM contracts now have health and welfare provisions. Machinists average $2.33 an hour. 1956: 2,000th active local chartered. New ten story Machinists Building dedicated at 1300 Connecticut Ave., Washington, DC. 1958: IAM convention establishes a strike fund which was approved by the membership in a referendum vote. IAM membership now tops 903,000. 1959: Congress enacts anti-union Landrum-Griffin Act. 1960: IAM convention endorses JFK for President after personal visits from both Kennedy and Richard Nixon. IAM convention establishes college scholarship program. IAM establishes Labor Management Pension Fund. 1962: IAM Electronics Conference established. JFK issues Executive Order giving Federal employees a limited right to collective bargaining. Machinists now average $3.10 an hour. 1964: IAM convention endorses LBJ for President, after a personal appearance. Delegates vote to change name to International Association of Machinists and Aerospace Workers. Membership at 800,000. 1966: IAM members strike five major airlines and finally break through unfair 3.2% limit on wage increases. First dental care plan negotiated with Aerojet General. 1967: Railroad machinists lead shopcrafts against nation’s railroads. Congress forces return to work and arbitration. 1968: IAM membership tops 1,000,000. 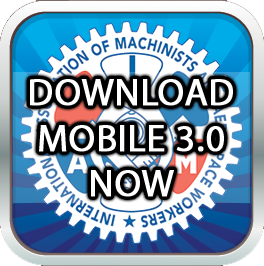 Machinists average S3.44 an hour. 1969: IAM member, Edwin (Buzz) Aldrin, the first space mechanic walks on the moon. 1970: Congress votes first Federal Occupational Safety and Health law. IAM is one of 19 unions in first successful coordinated bargaining effort against GE. 1971: IAM wins biggest back pay award in history, more than $54,500,00 for 1,000 members locked out illegally by National Airlines. IAM establishes Job Safety & Health Department. 1972: IAM membership drops to 902,000 as a result of recession and layoffs in defense industries. IAM President Floyd Smith quits U.S. Pay Board to protest unfair economic policies. IAM convention endorses Sen. George McGovern for President. 1973: IAM and UAW hold first joint Legislative Conference with 1,000 delegates in attendance. Machinists average $4.71 an hour. Membership rises to 927,000. 1976: IAM convention endorses Jimmy Carter for U.S. President., Delegates vote to set up Civil Rights and Organizing departments and expand community services program. 1977: William W. Winpisinger sworn in as the lAM’s 11th president. 1979: Citizen/Labor Energy Coalition launches first Stop Big Oil day to protest obscene profits by oil conglomerates while American workers” paychecks continue to shrink. 1980: IAM media project begins. Thousands of IAM members and their families monitor prime time TV to determine media’s portrayal of working people and unions. 1981: Older Workers and Retired Members Department is established at Grand Lodge. 1982: Reaganomics grips nation. Individual and corporate bankruptcies reach epidemic proportions. IAM membership begins drop to 820,211. 1983: IAM introduces ”Rebuilding America” act to Congress as alternative to Reaganomics and to rebuild nation’s industrial base. 1984: IAM convention in Seattle WA, endorses Walter Mondale for U.S. President. Delegates vote funding for Placid Harbor Education Center to improve the level of understanding of workers in an ever changing world. 1987: IAM Executive Council establishes new Organizing Department, the first ever to be headed by a Vice President. First IAM Communications Conference convened in Kansas City, MO. 1988: IAM celebrates 100th anniversary in Atlanta, GA, on May 5. 1989: George J. Kourpias sworn in as the IAM’s 12th president. 1992: IAM moves to new state-of-the-art headquarters building in Upper Marlboro, MD, to keep pace with technological changes and serve members” needs well into 21st Century; IAM convenes 33rd convention at Montreal, Quebec, Canada. 1994: International Woodworkers of America ratify merger agreement. More than 20,000 members join IAM family. Some 8,000 USAir fleet service workers say “IAM yes.” Machinist newspaper bids fond farewell, reborn as IAM Journal magazine. 1995: IAM, Auto and Steelworker unions debate plans for unification by year 2000. Unity plan sparks solidarity. Plan would create largest, most diverse union in North America, with more than 2,000,000 active members, 1, 400, 000 retirees. Sixty-nine day strike brings major victory in new contract at Boeing. Members air their views during first round of Town Hall meetings. 1996: ‘Fighting Machinists” spearhead political battle for worker rights. Union efforts provide winning edge in Clinton-Gore presidential victory. Meeting in Chicago, IAM Convention delegates build bridge to 21st century. Delegates establish IAM Women’s Department. 1997: On July 1, Robert Thomas Buffenbarger, 46, takes office as 13th International president in 109-year IAM history, moves quickly to reshape Union to reflect growing diversity, interests, concerns of IAM members. Former IAM President Winpisinger dies Dec. 11. 1998: New Blue Ribbon Commission empaneled to provide membership forum to voice opinions. Placid Harbor facility renamed Winpisinger Education and Technology Center to honor visionary union leader, who brought the facility into being. IAM members at Bath Iron Works in Bath, ME launch the first of the Flight IIA Arleigh Burke Class Aegis Destroyers. The ship, the Oscar Austin, is named after an African-American Marine who was awarded the Medal of Honor for his bravery in Vietnam. 1999: General Vice President William Scheri retires, Robert Roach, Jr. takes over the Transportation Department. IAM Shares mutual fund created; llows members to put money to work in a fund that invests in IAM-represented companies. The National Federation of Federal Employees affiliates with the IAM. Unification effort with the Steelworkers and UAW ends because of major philosophical differences; the three unions vow to work together, however. 2000 : The IAM endorses Al Gore for President. The AFL-CIO launches its New Alliance campaign, Grand Lodge Convention delegates respond with mandate that all IAM local and district lodges affiliate with their state AFL-CIO labor councils.The IAM meets in San Francisco for the 35th Grand Lodge Convention. The delegates establish Communicator and Educator positions. 2001: IAM Communications revamped with relaunch of website, online streaming of video, and repositioning of the IAM Journal as an advocacy magazine. IAM Executive Council reelected. William W. Winpisinger Education & Technology Center increases capacity by 50%. IAM Dedicates memorial to fallen members. IAM members perish in September 11 attack. The IAM volunteers to help in war against terrorism and to help America rebuild. 2002: The IAM establishes the Automotive Department and sets in place dozens of organizing blitzes. LL 2710’s Gary Blanke wins the IAM’s first photography contest. Members speak out at the 2002 Blue Ribbon Commission town hall meetings. Everyday Heroes, an IAM documentary, which tells the story of the workers who risked their lives in the aftermath of the 9/11 attacks, goes on sale. The proceeds go to treat rescue and recovery workers at Ground Zero. The Transportation Department ignites a nationwide Day of Action to urge passengers back onto trains and airplanes. IAM members join with other U.S. union members for the biggest midterm election turnout ever. 2003: The IAM creates the Department of Employment Services to help members cope with the worst recession in years; Tony Chapman named its director. IAM leaders meet in Cincinnati, Ohio. IP Buffenbarger vows “No more business as usual.” Presidential candidates Howard Dean and Richard Gephardt address the IAM leaders; Gephardt endorsed for president. GVP George Hooper passes away. Robert Martinez named Southern Territory GVP. ST Don Wharton Retires, Eastern Territory GVP Warren Mart succeeds Wharton. Lynn Tucker takes over as the Eastern GVP. James Brown takes over the Midwest Territory with the retirement of Alex Bay. 2004: The IAM Executive Council marches with thousands of trade unionists in Miami to protest Free Trade Area of the Americas. President George W, Bush’s “Wall of Shame” tours Iowa during that state’s presidential caucuses to bring job losses onto the national radar screen. CyberLodge, the innovative, open-source initiative to organize information technology workers opens for business. Former IAM President William W. Winpisinger is inducted into the International Labor Hall of Fame. The 36th Grand Lodge Convention convenes in Cincinnati and salutes North America’s Might. Vice presidential candidate Senator John Edwards from North Carolina appears at a convention rally after a unanimous endorsement of Senator John Kerry and Senator Edwards by the delegates. 2006: After years of one of the most anti-labor Congresses in decades, strong voter turnout by union members helps put a pro-labor majority in control of the U.S. House of Representatives and a razor-thin majority in the U.S. Senate. 2008: Barack Obama becomes the first African-American elected President of the United States. Labor voters again play a key role in national elections, increasing the pro-labor majorities in the House of Representatives and U.S. Senate and a pro-labor president. Pro-labor candidates win key governorships and legislative races. 2010: In January 2010, a decision handed down by the ultra-conservative majority on the U.S. Supreme Court allows unlimited spending by corporations in U.S. elections, opening the floodgates for corporate cash in the November elections. Pro-business candidates sweep midterm elections and take control of the U.S. House of Representatives, gain control of many state governorships and secure anti-worker majorities in many state legislatures. 2011: Pro-business governors and state legislators elected in 2010 start nationwide assault on unions by attacking the right to collectively bargain, proposing right-to-work (for less) laws and other measures to weaken unions. Mass protests erupt in Wisconsin and spread nationwide.